We started our bike trip at Ban Kokkod in Chong Sadao and ended the eighth bicycling day at Khong Thongthip Resort in U-Thong. Technical data of the trip was as follows: Total Distance: 97.5 Km; Moving Average: 22.2 Km/Hr; Overall Average: 17.1 Km/Hr; Maximum Speed: 50.1 Km/Hr; Moving time: 4 Hr 23 Min; Stopped Time: 1 Hr 19 Min; Total Time: 5 Hr 42 Min. 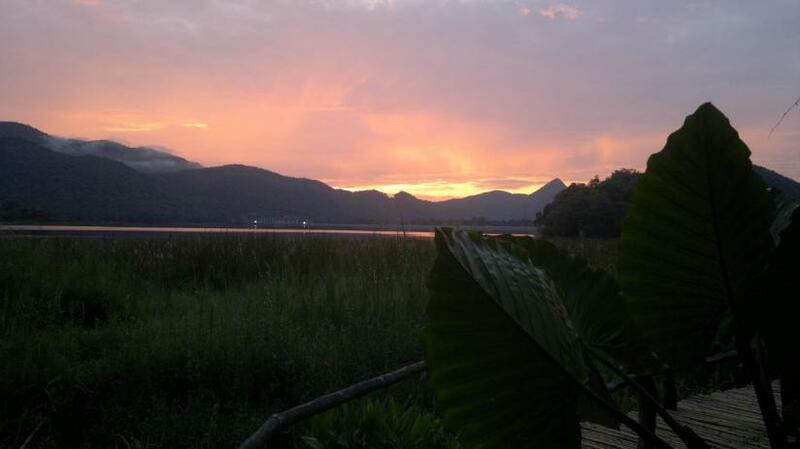 0600 Hr - The morning broke slowly above the Tha Thung Na Reservoir. The first yellow-red light set the hills behind the dam on fire. It was a beautiful sight seen from the resort. The owner prepared our breakfast a bit earlier than normal in order to give us the occasion to start early. It was a very light and fast breakfast. Steve as always in the morning, was eager to jump the bike. We left the resort at 0630 Hr. The dogs of the owner accompanied us to the gate. One of the dogs not only barked goodbye, but joined us on the road. We tried in vain to send him back home, but he continued following us. Finally arriving at the bridge over the Khwae Yai in Phong Pat we had to phone the owner to come pick up his dog. The river bed of the Khwae Yai stood nearly dry as the Thung Na Dam not opened yet its water gates. At first view the river in this area had to be very shallow. 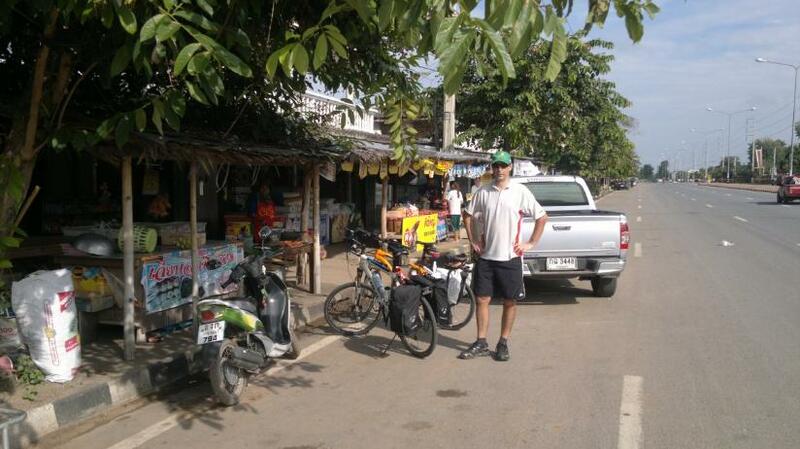 Arriving at the Phong Pat crossing, Steve had a problem with his bike crank, furiously making noises. We stopped and Steve sprayed the bearings with Teflon. After an hour we made a first short stop. We arrived at Wat Pa Lelai locally known as Wat Pha Ok at 0800 Hr. This monastery located in Lat Ya Sub-district was in the Ayutthaya Era one of the temples of the important frontier outpost of Kanburi. The old town, located at the foot of the 200+ m high Cockfight hill was many times involved in the battles between the Thai and Burmese Armies during the Ayutthaya period until the Early Bangkok period. 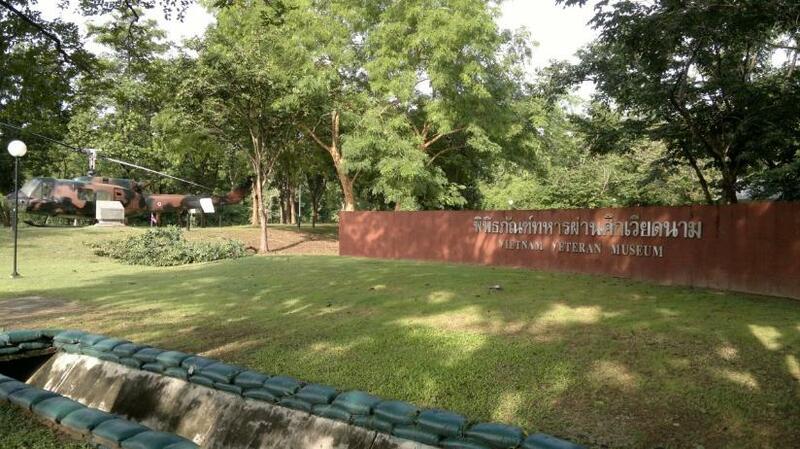 Kanburi was the place where Khun Paen, the hero of the epic tale Khun Chang, Khun Phaen grew up. One of the Kanburi temple ruins is called after him. In 1833 AD, during the reign of Rama III, the town was moved to the present location of Kanchanaburi at the confluence of the Khwae Yai and Noi Rivers forming the Mae Khlong. More ruins of temples and fortress remains can be seen south of Wat Pa Lelai, but a detailed visit of the old Kanburi was not in our planning of the day. A bit further we turned into the road to Bo Phloi known for the mining of alluvial blue sapphire in several open pits, most famous in south east Asia. We passed the Vietnam War Museum of the 9th division, a commemoration location for the Thai involvement in the Vietnam War out of fear for the communist intentions of the neighbouring countries. During the war Thailand had by 1969 a total of nearly 12,000 combat troops in Vietnam, while the United States assisted the Thai forces in resisting Communist guerrilla activity along the Laotian border and in the south on the Malay Peninsula. While Steve continued, I took the occasion to take some pictures. At Ban Nong Krathum we stopped to buy a refreshment. The sun was hiding behind the clouds, but the heat was there. We had done about 50 Km and felt a bit dehydrated. I had only a light breakfast and I was used to take in much more calories in the morning. I emptied three Ovaltines, ate some snacks to compensate the missing food and returned to normal conditions. 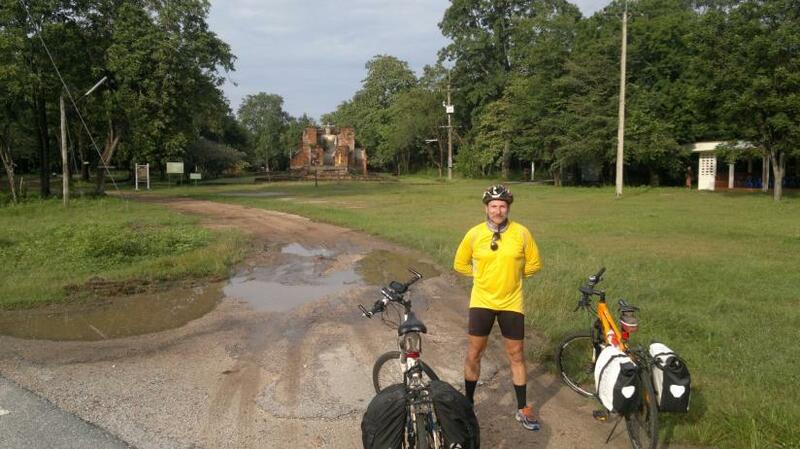 We continued to Bo Phloi where at the crossing toward U-Thong, Steve drove into a pump station to fill up his tires. Around 1030 Hr at Huai Krachao, we made another stop to fill up our water bottles and we biked than until we reached our accommodation in U-Thong. Our bungalows were not yet available at the Khong Thongthip Resort and we went for a Magnum ice cream at the 7-Eleven in the vicinity. A good half an hour later we were signaled that the rooms were ready and we went to rest. Steve had bought some movies at the 7 and spend the afternoon looking films. I had planned to visit the Phu Muang Forest Park. When the sun started to lose its strength I started off after first having drunk a coffee at the local Café Amazone. I biked through the main gate of Wat Khao Tham Suea and followed a board indicating the ancient elephant kraals. It was a run for nothing in which I drove through a Chinese cemetery. I turned the wagon and decided to climb up in direction of the monastery, when I saw some Fine Arts Department indications of the Dvaravati-era earthen kraals. The site was not very impressive so I biked up to the temple for information. I required after the Dvaravati laterite foundation presumed to have been a venue for royal rituals before catching wild elephants. A monk indicated the place further up hill, which I found a bit suspicious as the earthen kraals where at the foot of the hill. I biked further up hill until the track stopped at a vihara with a reclining Buddha. 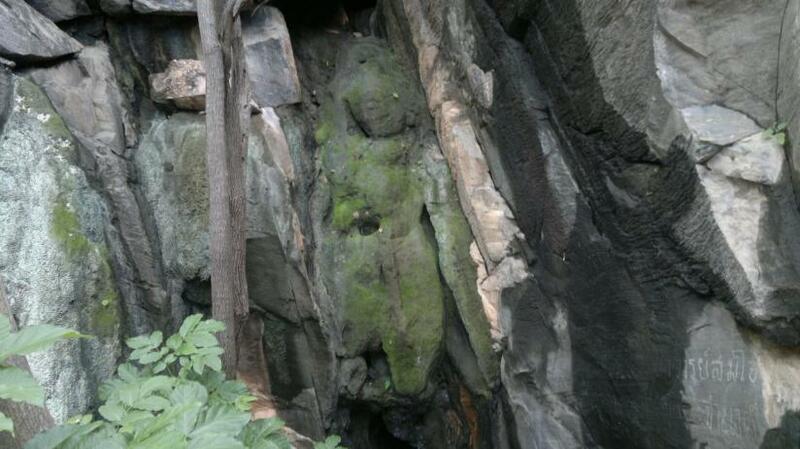 Next to the vihara there was what maybe was a rock carving of what could have been a Bodhisattva. Some makeshift stairs went up next to the carving. 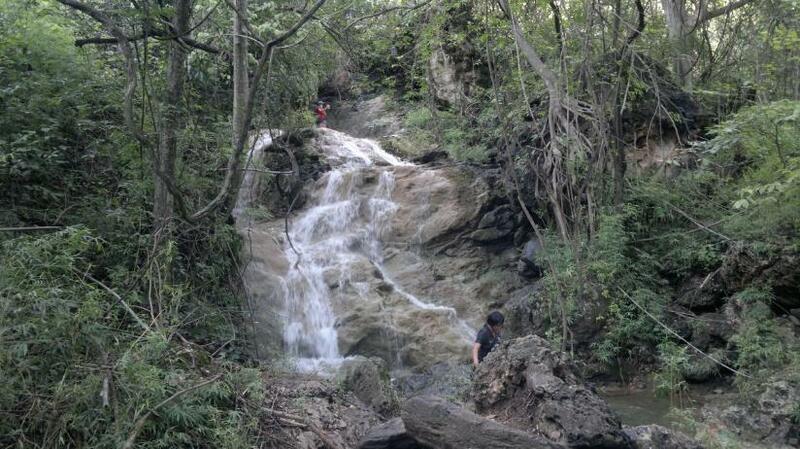 I climbed further up over a rocky area following some signs made of a monk's clothes but I found nothing. I stopped the climb, afraid to break some bones or to be bitten by a snake hiding under the lose boulders and returned to my bike. It became late afternoon and the sun was starting its approach of the horizon, but I still wanted to see the Phu Muang waterfall mentioned in the epic work Khun Chang, Khun Phaen. Shortly after I entered the park and drove close to the fall. I visited the area on foot and on my return found out that the rear tire went to the Walhalla. I noticed a few of thorns in my tire, which I must have gathered when biking in the vicinity of the earthen kraals.